Atfirst,Brynnjumpsatthechancetohelptheschoolinitsmissiontoridthecityofcorruptofficials--becausewhatcouldbebetterthangivingentitledjerkswhattheydeserve?Butthat'sbeforeshemeetshermark--asenator'sson--andbeforeshediscoverstheschool'sheadmasterhassecretshe'llstopatnothingtoprotect.Asthelinesbetweenrightandwrongblur,Brynnbeginstorealizeshe'sinwayoverhead.Synopsis (via Goodreads): Pretty Little Liars meets Ocean's 11 in this intrigue-filled contemporary drama from acclaimed author Kristen Simmons. When Brynn Hilder is recruited to Vale, it seems like the elite academy is her chance to start over, away from her mom's loser boyfriend and her rundown neighborhood. But she soon learns that Vale chooses students not so much for their scholastic talent as for their extracurricular activities, such as her time spent conning rich North Shore kids out of their extravagant allowances. At first, Brynn jumps at the chance to help the school in its mission to rid the city of corrupt officials--because what could be better than giving entitled jerks what they deserve? But that's before she meets her mark--a senator's son--and before she discovers the school's headmaster has secrets he'll stop at nothing to protect. As the lines between right and wrong blur, Brynn begins to realize she's in way over head. The Deceivers makes you question what's right and what's wrong. "The starving child who steals bread to survive, is he wrong? The man who kills his wife's murderer, does he not have that right?" I know that I would do anything to keep my family safe, and if our circumstances were different, that might mean having questionable morals. There are bad people in the world, and Vale Hall promises to exploit them and discreetly make the world a better place. I really liked the idea of a private school for teenaged con artists, although it made it hard to trust the secondary characters. I never knew if someone was playing a role or being genuine, and things are good and twisted by the end of the book. Everyone has a personal agenda, but they're also playing a larger role that could come crashing down on their heads at any moment. It was insane. One of the characters, Charlotte, says she and Sam handle their situation by remembering what's real and what's pretend, but I feel like those lines become blurred after awhile. I'm not sure how I feel about the director and his decisions, because he's essentially using children to gather secrets from powerful and dangerous people. He claims they are never in any real danger, but the fear is real and he cannot account for everything. 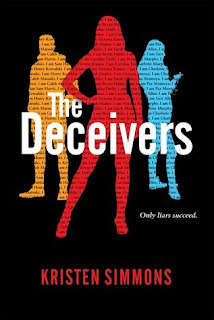 The Deceivers was a fun, quick read that held my attention. I wanted to know how Brynn's assignment worked out, and whether or not her past would weigh down her future. I was also curious about the other students, especially Caleb, and what they were doing on the director's orders. The romance was awkward, and I was happy when it didn't feel forced. They were just two people getting to know each other, which is difficult when they share more secrets than truths. It was hard for them to develop trust and feelings, because they were both guarded and working through their own problems. Their connection was subtle at first, but really grows when they begin working together. I really enjoyed this book, although it did drag in a few places. The beginning of the story starts off with a bang, but Brynn's adjustment period is slow going. They kept saying it was about the long con, but it was hard having the patience for it. I wish we'd learned more about the secondary characters and their assignments, because I thought they were all very fascinating people. They come from various backgrounds, and they're all willing to do whatever it takes to survive and move up in the world. There are a lot of surprises at the end of The Deceivers, but only a few that I anticipated. If you think about it, it's a place for con artists, so a few twists are to be expected! Everyone has secrets and personal agendas, and it was interesting to see how they all overlapped. I would definitely recommend this one! This does sound fun, I can see why you picked it up. Glad you enjoyed it! It was definitely different! I enjoyed reading about characters that live in a morally gray area. Everyone at the school is required to pretend, lie, steal, etc. in order to obtain the secrets the director desires. They have to compromise a part of themselves to succeed, and the reward is a better future. It was interesting to see why people made certain choices, and how those decisions impacted them over time. At least this one has a fresh premise! Would you say that the protagonists are a lot more fleshed out than the secondary characters (secrets notwithstanding)? What an interesting idea for a story. I thought so! I think the author did a wonderful job bringing it to life, too. It was a remarkable read. I'm happy I could pique your curiosity! I love books that have a boarding school setting, so I jumped at the opportunity to read one about a school for con artists. They're still required to learn the basics, but they're also taught how succeed in stealing secrets from people. It was an interesting concept that I think the author wrote very well. I found Dr. O confusing. He would seem one way and then he would do something that totally contradicted what I thought. I have a feeling we will learn a lot more about him and his motivations in future books. I am also hoping that is where Simmons will reveal more about the other "students" too, because I definitely want to know them better. He was confusing! What did you think about the painting in his office? The one he claimed was his sister? I was wary of him after Charlotte contradicted Brynn's information. He also has a degree in psychology, which I'm sure he uses with his students (whether they know it or not). He's learned how people think, and that makes him formidable. He also has sooo many secrets! I'm sure it would take two more books to uncover them all. 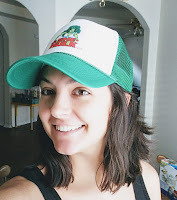 I want to learn more about Charlotte, Sam, and Henry! I guess Geri, too. They were an interesting group! My first thought when I started reading the synopsis was - nope, I don't want to read a book all about people being con artists. Basically, the "bad guys." But your explanation sheds new light. Even so, doing doing something for the wrong reason make it right? I often enjoy stories with a morally gray character, but a entire morally gray plot? Hm, I can't decide if I could go with that or not. Interesting. I can definitely see how it would be difficult to trust anyone, though! Hah -- you're right! The entire plot is morally gray! The book wasn't about bad people, though. Brynn has dealt with loss, abuse, and a constant fear of losing herself or her mother. She's willing to do whatever it takes to go to college, even if it means scamming people out of their money. Is it right? No. However, her living situation isn't right either. No one should have to live like that, so can I fault her for trying to improve her life in any way she can? This book made me question a lot! Yaaay I'm happy you enjoyed it. I agree that the adjustment period took a bit. oh I am so glad you liked this one. I have it coming up this week on my TBR. I am very excited for it and was hoping to see some good reviews. I really like books that question what is right and what is wrong. The decisions that could be crossing a line but maybe not. great review. Yay! I really hope you like it! Most of this book makes you question what's right and what's wrong, so I'm sure you'll enjoy it. ;) The characters are trying to survive and make something of themselves, and sometimes that requires being dishonest. The boarding school setting is very cool! Ohhh, this is interesting to see a con-artist novel mixed with boarding schools. Did it give off Hogwarts vibes or was the school unique? This post makes me think of Victoria Schwab's "Vicious", which has morally-grey/totally not nice people. The novel now has a sequel that I have read as well. If you like some superhero/villainy awesomeness, that novel could keep you in a similar vein as "The Deceivers." There wasn't a Hogwarts vibe, haha! The boarding school was an old house that had been converted for the director's purposes. He never has more than 20 students, so there's no bustling in the halls, or large dinners for everyone. It was a simpler life (excluding the conning classes). I adore V.E. Schwab's books, but haven't had a chance to read Vicious! It's on my list for this year, so hopefully I'll get to it soon. I enjoy books with morally gray characters, because that's the world we live in. People are willing to do whatever they think they can get away with, and sometimes they have a good reason for doing it. It really makes you think!